Creating a series of nested directories within one another can be done instantly through the command line. This makes it very easy to immediately and recursively create a complex directory structure of folders within subfolders of subfolders, without having to navigate manually into each directory to create a new directory, then navigate again to that subdirectory to create yet another directory, and so on. Instead, a command line trick will create the complete intermediate directory path in one fell swoop. Building a nested directory structure the easy way requires the usage of the familiar mkdir command, which is routinely used to create a single new folder, but with the attachment of the -p flag to specify a full path to create. 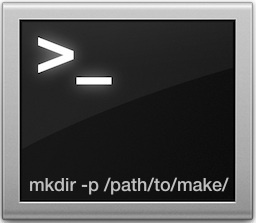 If you want to try this yourself, launch the Terminal app as found in the /Applications/Utilities/ folder and follow along to see how to use mkdir -p to build a series of directories within a single command line using a specified path. The -p flag insures that all subfolders are made recursively and in the appropriate place. This will make the “Create” folder as the parent directory followed by the full series of “/These/Folders/Within/Each/Other/” as the appropriately nested child directories. You can specify as long of a path as you want to build and it will instantly create the parent and all intermediate child directories. This is a really useful tip that we covered a while back as part of a handful of useful command line tricks, but considering the convenience it’s well worth covering on its own. And yes, using the Terminal is by far the quickest way to accomplish this, as there is no similar trick specific to the Mac Finder, though one could theoretically automate nested directory creation through the Automator app in OS X if so desired. For what it’s worth, the mkdir command works the same in both Mac OS X and linux, so you can use it across platforms if desired. Want some more command line tricks? We’ve got you covered. mkdir -p is best remembered as ‘parents’, it will create all parent directories as needed if they don’t already exist. Been doing this for years, it’s standard unix. Didn’t realise it was a problem! There’s a fairly useful command called ‘man’ as well. You can do things like ‘man mkdir’ and ‘man -k dir’, the first one tells you how to use a specific command, the second one searches for a keyword if you’re not sure of a command. `mkdir` is a real time saver. 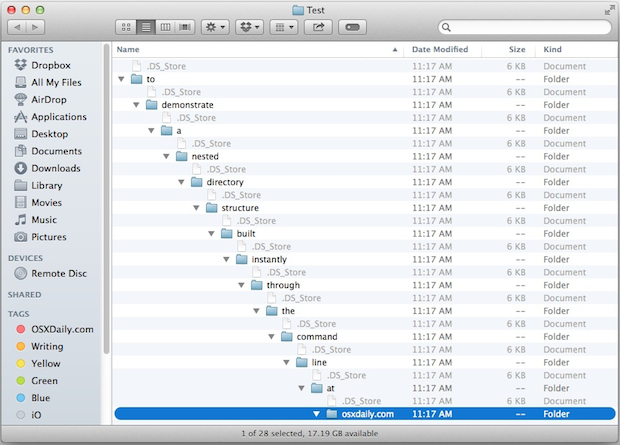 You can really build a great sequence/structure of folders. But that was just an example how you can “throw up” a folder structure before you clean up an old disk. You can also include dots to create peer level directories. e.g. @jsan: Now *that’s* a tip I didn’t know about and many times wish I did. Thanks for that. uh-uh, why is it giving me “Permission denied”? This will create FolderP (and its subfolders) in the root folder which starts with /. Maybe that’s why is asking for permission. and then type the password of your system.